The National Trust for Historic Preservation and People for the Pavilion are thrilled to announce the winners of the New York State Pavilion Ideas Competition. 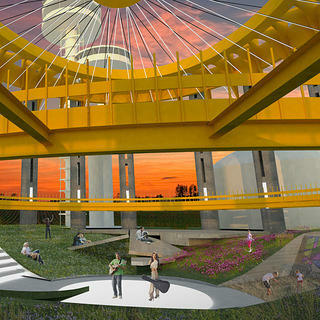 Sponsored by Queens Borough President Melinda Katz, the competition sought to raise awareness across Queens and around the world of the New York State Pavilion and its possible future uses. And what can we say? The “anything goes” approach to submissions brought in a multitude of jaw-dropping ideas, from a cheeseburger museum (seriously!) to a sustainable farmers market. The winners were selected by a panel of expert judges with experience in design, architecture, community engagement, planning, public policy, and public space management. Of the more than 250 incredible ideas submitted, these four represent the most exciting, forward-thinking, and imaginative futures for the Pavilion. 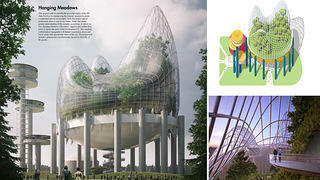 Third Prize: "Pavilion for the Community"
A repurposed Pavilion would serve as the base to a suspended natural environment with its design nodding towards the future. Focusing on the community’s priorities and input, this multi-purpose space would work in conjunction with public programming. This plan would transform the Pavilion into a cultural marketplace working towards harmony through human interaction and sustainability. This special category was created to highlight the outpouring of creativity we received specifically from residents of Queens. 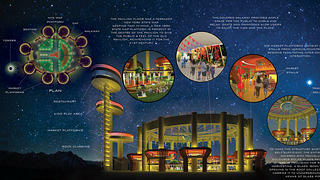 Dubbed the “Pavilion Park” (pictured at top), the winning entry seeks to honor the historical significance of the space and convert the vacant Pavilion into a public park. The National Trust and People for the Pavilion will host a companion exhibit at the Queens Museum from August 5-28, 2016, where visitors can view the top entries from around the world and learn more about the history of this iconic World’s Fair structure. 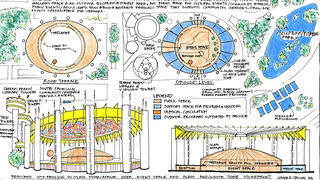 To view all of the entries for the New York State Pavilion Ideas competition, please visit www.NYSPideas.org.